Create up to 20types of barcodes, Easily generate and print sequential barcodes. One powerful product for all your card and label making needs! The product support Post Net barcode and can be used for barcode generating, The powerful database, address book and mail merge feature allows you to easily print multiple labels and envelopes in one go, using data from a print list. so you can get your work done faster. Easy switch between database and label views, instant previeweing make the work with the product intuitive and quick. Now this professional Mac Label Maker is an ideal solution for design and prints christmas address labels, christmas postcards, greeting envelopes, holiday cards, gift tags, and etc. 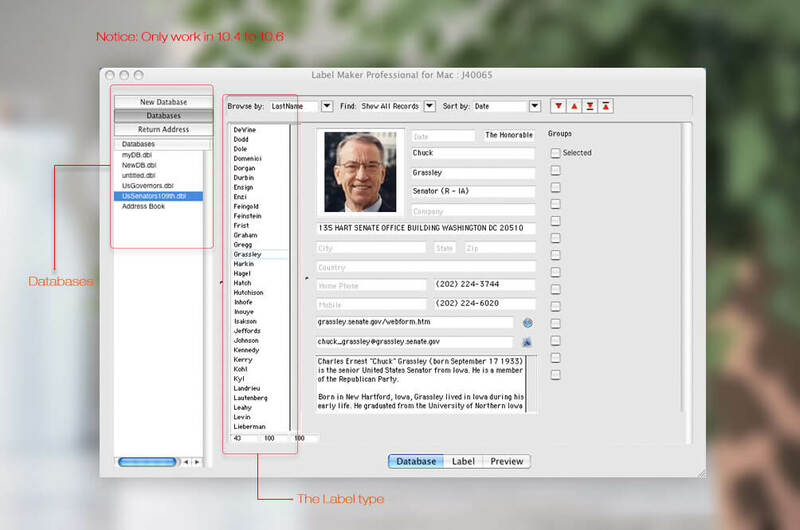 Make and Print custom Labels Quickly and Easily. Batch print addresses from Apple Address Book, database or tab-delimited text files. It is perfectly compatible with Mac OS X Snow Leopard. 1. Double click on the .dmg file to open the file. 2. After the disk image window open and you seen the iWinsoft Label Maker Pro folder. Drag the "iWinsoft Label Maker Pro" folder from the disk image window to your Applications folder. 3. Go to your Applications folder and start Label Maker Professional. Don't use a Mac? NOT supported Mac OS X 10.9 - 10.8 operating system.